In mid-June 2015, PRO referee Jose Carlos Rivero made Major League Soccer history by calling the league’s first ever hydration break. 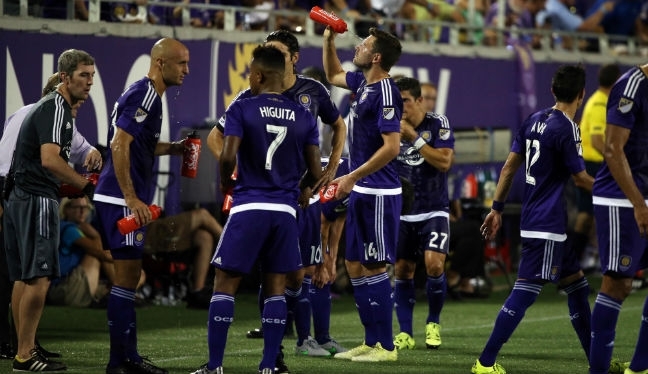 Before 30,054 at Citrus Bowl, during the game between Orlando City and D.C. United, the players of both teams took two hydration breaks – one in each half, at around the 30th minute of the first half and then again on or around the 75th minute of the second half. Can you explain the hydration break? The hydration break is a competition rule in Major League Soccer and it means that in each half of the game, at around the midway point, we can have a break of up to three minutes to re-hydrate. The time allowed for the break is then added on at the end of each half. The call for a hydration break is made using the Wet Bulb Globe Temperature, using factors such as air temperature and level of humidity. The readings are taken by the fourth official at the midfield by a special thermometer. If the reading is 89.6 or above, we make the call to have a hydration break. Immediately, we inform the administrators of each team, the coaches, and the captains. A second temperature reading during the half-time interval has also been introduced by MLS. This allows for increases in temperature during the first half, that pushes the temperature over the limit. If the temperature is recorded above 89.6, or fails to drop more than 10 degrees Fahrenheit then a hydration break is allowed during the 75th minute of the second half. Did you feel the benefit of the hydration break in Florida, and do you see them as beneficial? I believe the hydration break helps the quality of soccer on show, and hydrated players are better performing players. As a referee, it’s great to have a hydration break. It gives us time to recharge, reprocess and to hydrate ourselves. As a referee, you are constantly running for 90 minutes, whilst also engaging your brain for decisions and communication. It was only a month or two ago that we discussed an extreme rain storm with fellow PRO official Ismail Elfath in Texas, now we’re talking about high temperatures – do you always expect the unexpected as a referee in North America? We are trained and prepare ourselves to expect the unexpected, yes. One weekend the temperature will drop and it’s very cold. The next weekend, it will be a high enough temperature to need a hydration break. Then we can go and referee a game and experience a water storm. We always prepare ourselves, whether that be for the cold, the heat, or a storm. We are always ready. North American refereeing is very unique and it’s a very exciting place to officiate. We never have our guard down, and we are always mindful that something unexpected could happen. How is this season going for you, are you enjoying MLS? The season is going well. There’s a lot of intensity in the games, and I’ve been working very hard both on and off the field. I’m very happy with how things have gone. The team of referees at PRO are also working very hard. The training, the traveling, the preparation, the games – it has all been amazing. Being a referee in MLS is an absolute privilege. I’m very happy and blessed to be a part of soccer, being in the game with the teams, the players, the fans, and in the environment of the beautiful stadiums. What about training – are you feeling fit and healthy? Training with PRO is very good. I’m very happy with how things are going. Whether we travel to train together or train by ourselves, the daily exercises are different and we are always challenging ourselves, and that’s credit to the support staff who are always trying to get best out of us. Being fitter and healthier makes it easier to officiate. The fitter you are, the closer to play you can get. – Major League Soccer introduced hydration breaks for the 2015 season. – Hydration breaks can be implemented if the Wet Bulb Globe Temperature index measure 89.6 degrees Fahrenheit or higher. – The fourth official is responsible for reading the Wet Bulb Globe Temperature, after the pre-match warm-ups. – A second temperature reading takes place during the half-time. This takes any increases in temperature during the first half into consideration. – Hydration breaks can last up to three minutes and take place approximately 30 minutes into each half. – The time used for hydration breaks will be added on at the end of each half. – The ball must be out of play for a hydration break to start. – At the 2014 FIFA World Cup, a water break was called in the 39th minute of the match between the USMNT and Portugal. This was the first hydration break ever at a World Cup.